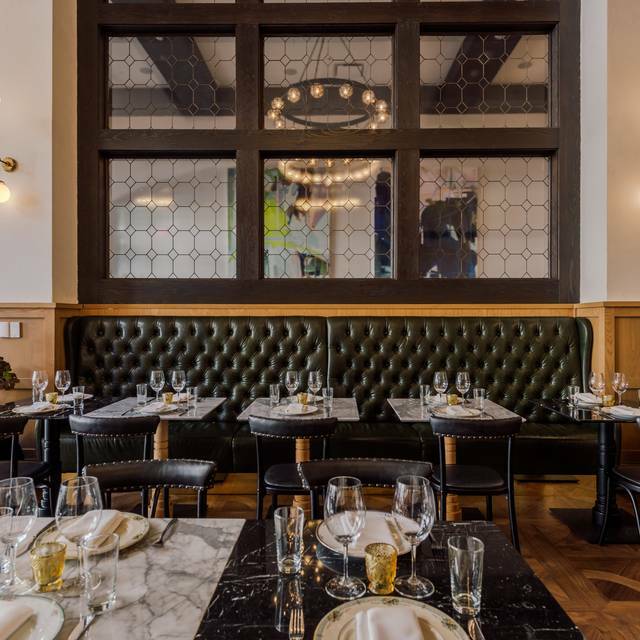 You must make reservations at least 5 minutes in advance of the time at Breva. 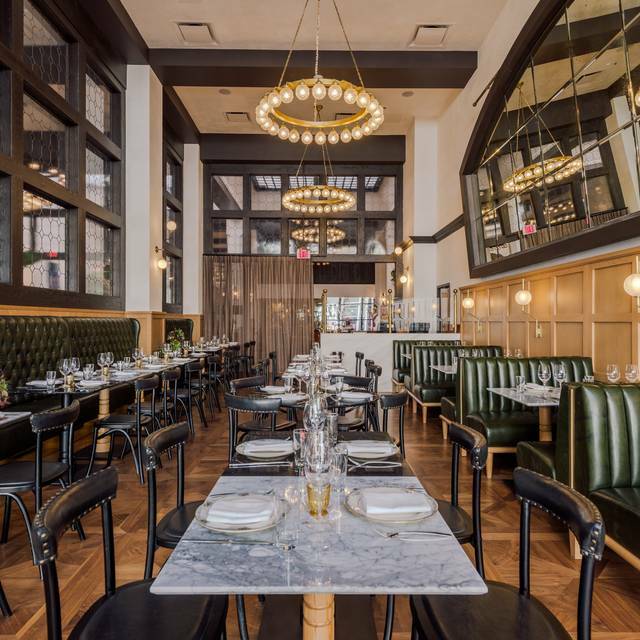 Breva is Chef Casey Lane's Basque inspired brasserie with Mediterranean influences. The menu captures the flavor and conviviality of the Western Mediterranean culture while incorporating California’s finest fresh and seasonal ingredients. 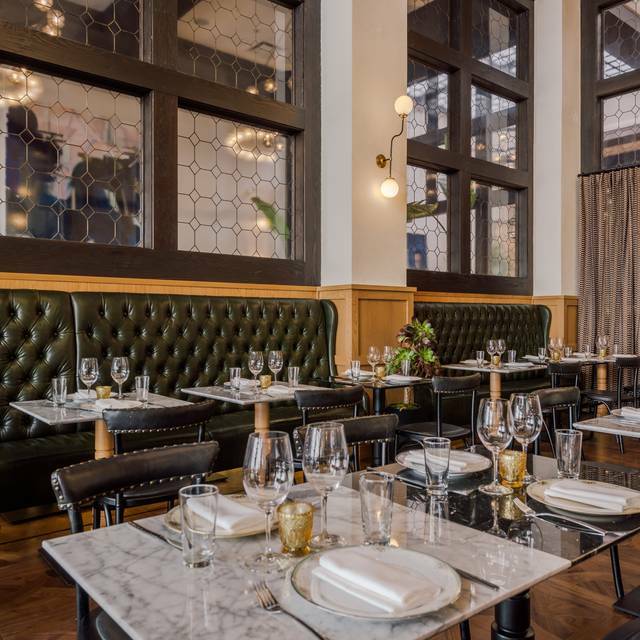 Signatures include Whole Grilled Branzino and Huntington Meats Ribeye, along with an array of vegetable focused dishes with distinctive preparation, such as Moorish Spiced Carrots with Hazelnuts and Tangerines, and Sautéed Pea Tendrils with Lemon Breadcrumbs. All are designed to be served individually or shared family style. Breva's authentic Basque Gintonicos and classic cocktails are mixed at Bar Figueroa, created by Dushan Zaric. After stating in the reservation that a Birthday was being celebrated, and then informing the staff in person, you would think that someone would acknowledge the birthday person. Not once! Therefore, I would not recommend this restaurant for any celebration! Breva has an assortment of interesting small plates. The marinated eggplant is a very small single portion and had mint in it which I didn't expect (and isn't noted on the menu). Favorite dishes were the roasted mushrooms - savory and delicious, the butternut squash with the jamon chips and beluga lentils. the squid was OK but reminded me too much of a calamari app I'd get at a chain restaurant. I very much enjoyed the Nightengale cocktail and my dining partner had the Picon Punch which was not to his liking. We split a bottle of wine that was reasonably priced by restaurant standards. Mediocre food, otherwise a total disaster. Extremely slow service. I waited 10 minutes for a glass of wine. When I asked I was told “we have very complicated drinks and bar orders get backed up.” Then change the drinks or get more bartenders. The waiter was not. easily found during the meal. The check was inaccurate. Everything about the night was a hassle. We just wanted out! The restaurant and hotel are beautiful, the service was great! The portion sizes are small and to be honest, the main dishes were ok. We started off with 2 different appetizers (the fried oysters and the hamachi), both were great. For our main dishes we had the muscles and the lamb, both were meh. The drinks were delicious so I have no problem coming back for that but probably won't dine here again. I wish I could review the food. But after making a reservation and arriving early to it, we waited 40 minutes. Everyone who arrived after us was seated. We were told multiple times that they were clearing the table, setting the table and printing menus (apparently they kept running out of food). When I looked into the dining room, only half the tables had people at them. Since it was my boss's birthday, we left to find somewhere else to eat. So zero stars for service. I can't judge on food since we never ate there, but Open Table forced a rating to submit this. We made a reservation on open table but when we showed up, the hostess was completely overwhelmed. It seems the restaurant didn't plan well given the large conference in town and the JT concert taking place that same night. Diners came and took forever to leave, backing up the reservations. Once we were seated, the meal arrived quickly, but it did not live up to the hype - and because we were seated late, we were rushed to get back to our other events. Food was excellent, only drawbacks were service, to-wit: we ad a 5:30 sitting, one server started and for some reason we were assigned another and had to go thru preliminaries once again. Then at the end of the meal there was a mix-up at the cashier ( or whomever does the financial transactions) mixed up the checks and credit cards between two tables, which was corrected . We left the table with more receipts than we would have at a CBS checkout. We are awaiting our card statement to see if all was corrected. This would be the first and very last time I come to this restaurant. The food is not to die for and the service is terrible. Wish I can travel back in time and let myself know not to waste my time & money in such a restaurant. The service is just outstanding! From the moment you walk in until you leave. I will come here again and again and again. Great food and drinks but it is the people that work at this restaurant what makes it super special. Interesting experience, but way too loud. Tables in the hotel lobby/bar area is a bad idea. Food was outstanding, wait staff very attentive. The lounge style seating and large table made us feel like Bruce Wayne and Vicki Vale at first 🤣. Hope they make some adjustments. Hostess was rude and staff seemed like they were overwhelmed. Wouldnt recommend this place. While the restaurant had lovely ambiance, our reservation was honored very late because the restaurant was busy and all our food was served cold, even frozen in some circumstances. The restaurant had great drinks, but I wouldn’t recommend this place for food or any special occasion. The food was delicious in a very nice setting. Great food, service and staff. Love the style and great place to hang out. The food and service was excellent. The portions are not large, (except for the panna cotta which was very substantial,) but the food was well prepared. The dinner menu was not extensive, but enough variety for our party of three. The lunch menu appears to be more extensive. We had a great meal and wonderful service. Very fun menu with a wide range of choices for all the foodies in our group! This is without question one of the worst restaurants we have ever been too. Perhaps new?? very disorganized. Hostess needs training for sure. The menu was limited and what we ended up with was barely eatable. I can't image who would name this "fit for foodies" that is very misleading. The only thing I can think of is that mostly very young people frequent it and just do not know the difference yet. The bar and bartender was really nice and we would recommend it but not the restaurant. After reading reviews we went specifically for certain dishes we read about, but to our disappointment none of the dishes were offered that night. Apparently they print a new menu for each day so call ahead if you want the ham and cheese croquettes, or the sliced steak, or the decadent chocolate cake. We were staying in the hotel so we decided not to leave based upon the fact that it was pouring outside. The pork appetizer was the best part of the meal. The paella (which you have to ask about because it’s not on the menu - just pictured in the elevator) and the $26 (!) burger were good, but nothing to get excited about. Went across the street to get dessert because we had set ourselves up for some chocolate. Overall just not what we had hoped for, but not bad, just disappointing. Took my son and his girlfriend there for dinner for his 27th Birthday. We had a great dinner, great service and because it was during the Dine LA program it was a great value for the money. We went to Breva, for the Dine LA, the menu was exquisite , I have the squash rings, the clams , and the cocktails were very good and innovative , I love what they did to the restaurant of the Hotel Figueroa. Conveniently located in DTLA, as we were attending a concert at the Music Center thereafter. Great food! The bone marrow was delicious and so were the cocktails! Kinda stressful figuring out how to get to the restaurant because it is in downtown L.A. and the parking isn't obvious. Had to drive down a back alley to park in a dark parkinglot behind the hotel. 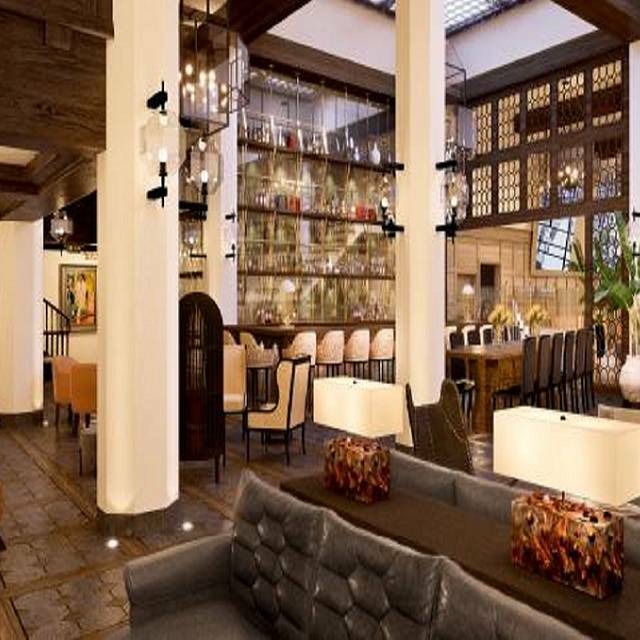 Located in the Hotel Figueroa, Breva is a delight for the eyes and the palate. The high ceilinged beautiful room still manages to feel cozy and intimate. Cocktails were delicious, service was attentive and the food was delicious; the chicken was a standout. We enjoyed it so much we went back 5 days later and it was every bit as good as our first time. Except for Open Table telling me I wouldn’t get points for the reservation, everything else was stellar. Just ok. Nothing special. Service good. Menu selection was lacking. The service was slow and took a million years for the check to come. The so-called “top 5 desert in LA” mille-fueille isnt that great either. It was busy because of a concert. The waitress was not as attentive. The place is pretty. The porter house was delicious, the branzino was meh. Desert was good.